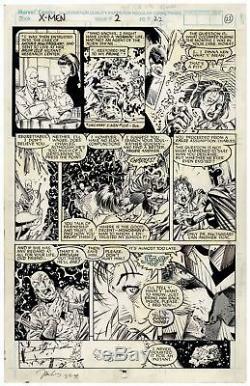 X-Men comic strip, issue #2 from the 1991 series relaunch, hand-drawn by Jim Lee and signed at the bottom by Lee on 5 February 1998. In this extremely detailed artwork, which is page 22 of the second issue, Magneto threatens Professor X's life and thereby pressures Moira MacTaggart to reveal what she did to Magneto as a child at her research center. With excellent, explosive graphics, penciled by Lee and then inked by Scott Williams. Tom Orzechowski adds the lettering to the story, written by Chris Claremont and Lee. Drawn upon Marvel Comics illustration board, with dialogue bubbles glued on. Williams' ink quill test scratches appear on the verso. Comic strip measures 11'' x 17''. Light yellowing from glue in some areas, but well preserved and overall in very good plus condition. The item "X-Men Comic Strip #2 Jim Lee & Inked by Scott Williams" is in sale since Saturday, July 29, 2017.